We appreciate your visit to our website and want to assure you that we respect your privacy. This website is owned and operated by Lantern Theater Company for the primary purpose of providing general information about our programs and activities. Lantern Theater Company's website deposits small text files of information called "cookies" on every visitor's computer. Cookies are sent back only to the website that deposited them when a visitor returns to that same website. Cookies tell us how and when pages in a website are visited and by how many people. This technology does not collect any personally identifiable information; all information collected in this manner is in aggregate, non-identifiable form. We use the information collected through this technology to inform future improvements to our website and other programming. Lantern Theater Company requests personal information when visitors order tickets, make a donation, register for classes, submit general forms, or contact us to request specific information. At the visitor's discretion, this personal information may include name, email address, phone number, mailing address, etc. Lantern Theater Company never collects any personally identifiable information, except that which is voluntarily submitted by website visitors. Lantern Theater Company may engage reputable third-party vendors that help us manage our website and/or marketing campaigns, and allow us to provide better service to our visitors, patrons, and donors. This may include third-party vendors engaged to analyze, for marketing purposes, the information collected on our website. The information provided on this website is for general use by our audience, and all information is subject to change without notice. Information contained on this website is presented "as is" and may contain inaccuracies. Lantern Theater Company's website is offered to you conditioned upon your acceptance without modification of the terms, conditions, and notices contained herein. Lantern Theater Company offers no liabilities or warranties of any kind in your use of this website. This website is owned and operated by Lantern Theater Company. The contents of this website including all text, logos, graphic design, video, audio, and website design are for personal, educational, and noncommercial use only and are the sole property of Lantern Theater Company. No part of this website may be reproduced in any form whatsoever without prior written consent from Lantern Theater Company. 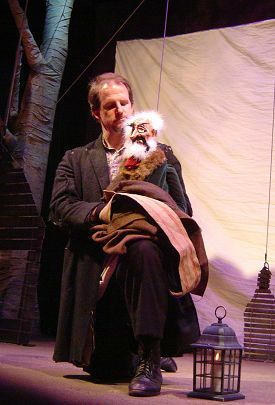 Pictured: Anthony Lawton in the world premiere of The Foocy (2006, Barrymore Award nomination for Outstanding Overall Production of a Play). Photo: Janet Embree.